Converter from YouTube to MP3 can download online videos from YouTube, Google Video and Nico Video and convert them in one step, YouTube video quality can be specified from mobile 3GP, standard FLV, high quality MP4, 720p HD and 1080 full HD, and 4K UHD. You can merge several video clips into one and clip multiple segments from a single video. Additionally, Converter from YouTube to MP3 also supports adding .srt external subtitles to any video formats and burning videos to CD/DVD media. As an all-in-one converter from YouTube to MP3, Any Video Converter Free can convert YouTube videos to almost all video formats including DivX, XviD, MOV, rm, rmvb, MPEG, VOB, DVD, WMV, AVI to MPEG-1, MPEG-2, MPEG-4, 3GP, FLV, F4V or Flip videos. It also converts DVD to MPEG, AVI, WMV, MPEG, 3GP video, MP4, etc., which's playable on your mobile phone, TV, PS4, and other portable video device. For YouTube video fans, Any Video Converter Free is undoubtedly the ideal Converter from YouTube to MP3 for downloading and converting YouTube videos to a vast array of popular formats such as AVI, MPEG, H.264/AVC, MOV, and many others. The amazing "downloading + converting" one-step solution lets you easily download and convert YouTube videos for playback on your iPod, iPhone, iPad, Apple TV, PS4, Android phones, Xbox and other multimedia devices. Step 1: Download and Install Any DVD Converter on PC. Download and install Any Video Converter Free on your PC or Mac, then launch it. Go to YouTube sites to copy the video URL. Click button and a window will pop up, then you can click icon to paste the URL. 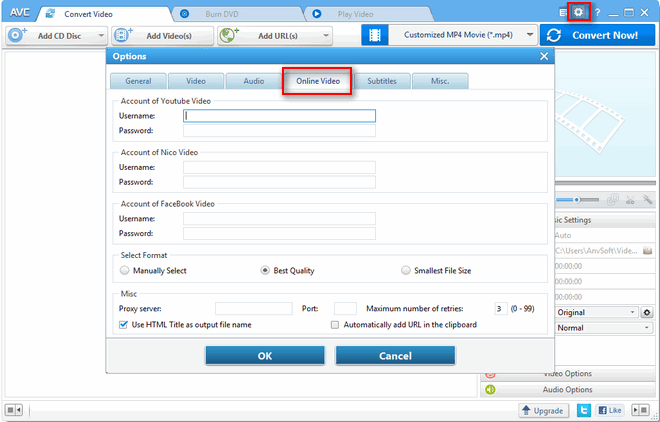 Or you can drag & drop video or music from YouTube to Any Video Converter Free directly. Click Start Download! button to downloading YouTube videos. After Any Video Converter Free finishing analyzing the URL, the video will be downloaded automatically into your destination file folder. And you can continue to add more URLs to download videos or music in batch. Any Video Converter provides 3 options (Manually Select, Best Quality, Smallest File Size) to letting users choose the output quality. After launch Any Video Converter Free, click > Online Video > Select Format. If you choose Best Quality, the output quality will be 720P, 1080P or 4K, and this all depends on the source video quality. If you choose Manually Select, there will pop up a window to letting you choose output format like MP4, Webm, M4A, 3GP with different output quality. Then click OK to start downloading. If you want to convert the downloaded YouTube videos or music to other audio formats, such as MP3, AAC, FLAC, OGG etc., you just need to add these videos or music to Any Video Converter Free, then choose the audio format you prefer from the output profile. Just free download this TouTube Video to MP3 Converter and try it right now!